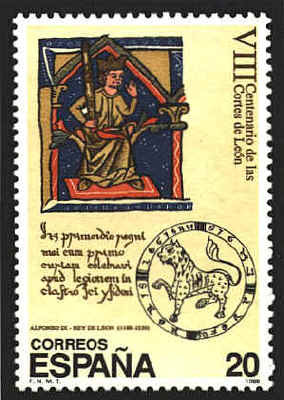 The stamp issued in 1988 commemorates the 800th anniversary of the establishment of the court of King Alfonso IX. Alfonso IX (1171-1230) was the king of León (1188-1230), succeeding Ferdinand II. He conquered several Moorish cities in Estremadura and was frequently at war with Alfonso VIII of Castile. His marriages with Teresa of Portugal and Berenguela of Castile were both annulled by the pope. He defeated the Moors at Mérida in 1230. His son by Berenguela, Ferdinand III, reunited León and Castile in 1230.